American congressman; born at New Orleans, La., Oct. 19, 1842. He was a student at the University of Virginia when the Civil war broke out; and in 1862 he entered the Confederate army, serving until the close of the war on the staff of Brig.-Gen. John S. Williams of Kentucky, and holding finally the position of assistant adjutant-general. Since the war Meyer has been largely engaged in the cultivation of sugar and cotton and in financial and commercial pursuits in New Orleans. In 1879 he was elected colonel of the First Regiment of the Louisiana State National Guard, and in 1881 was appointed brigadier-general to command the First Brigade, embracing all the uniformed corps of the state. He was elected as a Democrat to represent the First District of Louisiana in the Fifty-second Congress, and has been successively reelected up to and including the present (1904) Fifty-eighth Congress. Meyer has served on the committees on Naval Affairs and District of Columbia. 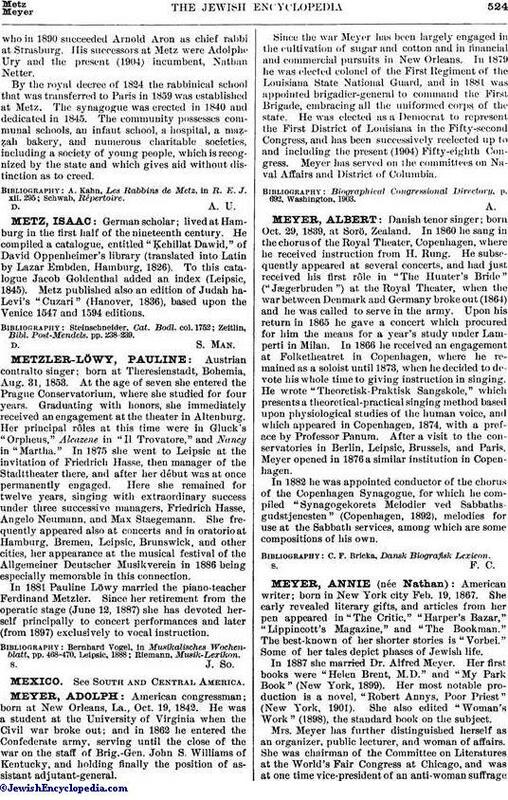 Biographical Congressional Directory, p. 692, Washington, 1903.